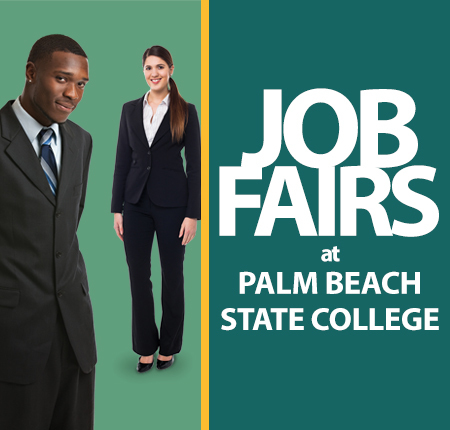 Three job fairs—two general and one specific to criminal justice—will bring 100 or more employers combined to Palm Beach State College campuses in October. Free and open to the public, the fairs will offer job seekers an array of full- and part-time openings to apply for, ranging from entry-level to managerial positions, as well as internships. The Oct. 11 and 16 job fairs, organized by the Career Centers on the Palm Beach Gardens and Boca Raton campuses respectively, will feature employers spanning business, government and health care. The Oct. 19 fair on the Lake Worth campus will focus on criminal justice jobs and is sponsored by PBSC’s Criminal Justice Institute in partnership with the National Organization of Black Law Enforcement Executives (NOBLE) and the Palm Beach County Association of Chiefs of Police. Attendees are reminded to wear professional attire and bring copies of their résumé. Fifty employers are expected to recruit, including Tenet Healthcare, City of West Palm Beach, Oxford Global Resources, MorseLife Health System, Federal Bureau of Investigation, Carr, Riggs & Ingram CPAs and Advisors, ESPN Radio, the School District of Palm Beach County, and the Club at Ibis. View the employer list or contact Julie Schettenhelm, career center administrative assistant, for more information at 561-207-5350 or email schettej@palmbeachstate.edu. Nearly 40 employers are confirmed, including the City of Boca Raton, NCCI Holdings, Brightline Trains, First Data, Palm Beach County Sheriff’s Office, PC Professor, Peace Corps, PhysAssist Scribes, and Palm Beach County Parks and Recreation. View the employer list or contact Shelly Titarahardja, career center administrative assistant, for more information at 561-862-4325 or email tirtaras@palmbeachstate.edu. Twenty-five law enforcement agencies are expected to recruit for law enforcement, corrections, 911 dispatch, crime scene and support positions. Confirmed employers include the U.S. Navy, Florida Highway Patrol, Palm Beach County Sherriff’s Office, School District of Palm Beach County and the police departments from Boca Raton, Boynton Beach, Coconut Creek, Delray Beach, Fort Lauderdale, Hollywood, Lakeland, Lauderhill, Manalapan, Margate, Miami-Dade, Oceanridge, Orlando, Palm Beach, Polk County, Riviera Beach, Seminole and West Palm Beach (including 911 dispatch). For more information about the Criminal Justice Job Fair, contact Annette Rodriguez at 561-868-3398 or email rodriga1@palmbeachstate.edu.